In order to assure high reliability of assessment, it is essential to have a standardised examinations and consistent definitions for the Functional System scores. It is highly recommended that physicians seeking certification first become familiarised with the Neurostatus Scoring Documents or equivalent case report forms for the respective study. 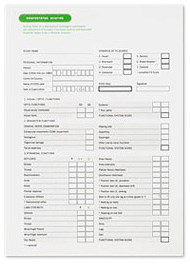 Clinical studies initiated after February 2006 will use the Neurostatus Definitions and Scoring Sheet. Studies that began prior to this date will continue using the Neurostatus Form. * To download the Neurostatus Scoring Documents specific to the studies you are participating in, please login to your personal Neurostatus e-Test account and select 'Scoring documents'.